I can tell you right away, that once you’ve mixed the ingredients, this curtido smells so good that it is difficult to wait for it to ferment. I admit, I ate a serving of it immediately before forcing myself to leave the rest to ferment. Fermenting brings out all those wonderful probiotics and adds to the vitamin, enzyme and mineral counts, so if you can resist that very tempting urge to eat it all right away, all the better. If you want to eat some right away, just mix things up, let it chill 20 minutes in the fridge and serve. 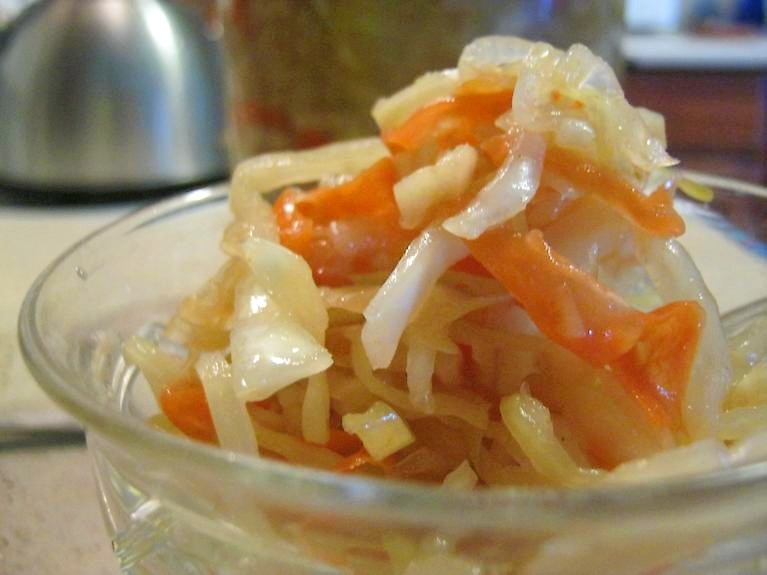 Curtido is a fermented Salvadoran cabbage relish traditionally served with pupusas (a corn tortilla). Served fresh it is more of a coleslaw, once fermented it is more like a Sauerkraut. Either way, it is delicious and simple to make. Wash and sanitize your fermentation container . I made approximately 6 cups of curtido from this recipe. 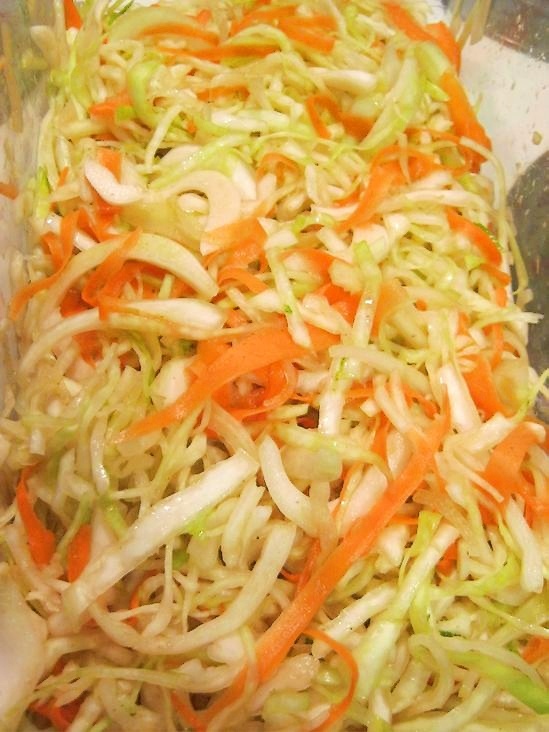 I use a large food storage container to mix things up when making fermented cabbage. That way I can spread everything in thin layers, adding salt between layers. Once I’ve massaged out enough brine, I transfer it to the fermentation container. Weigh out your sea salt and set aside. I use a scale like this , I love how easy it is to use and to store. While prepping vegetables, layer them in a large container and occasionally add a layer of sea salt. Remove outer leaves of cabbage. Slice into quarters and remove core. Slice into thin strips, or whatever is easiest for you. You can use a sharp knife, mandolin or a few pulses in the food processor to chop it into reasonably edible-sized pieces. Wash or peel carrots and slice thin. Use a vegetable peeler, a mandolin or some patience with a knife will work to make thin slices. Cut thin slices of onion. Fresh oregano will look a little prettier in the jar, just chop it up and add it in. Once everything is layered together, I give it all a 2 minute massage to begin coaxing out the liquids from the vegetables. Then cover it and leave it alone for 10 – 20 minutes and repeat. Sometimes the liquids come out easily, and other times you’ll have to keep working at it – but you don’t have to stand there massaging the cabbage forever. Just leave it to do it’s thing and give it a quick massage a few times. Transfer to your fermentation container and add a fermentation weights to keep everything under the brine. Cover with cloth held on with an elastic. It is important that everything be below the brine before leaving it to ferment to prevent mold. I used a plastic lid with a drinking glass to press things down and covered it all with a tea towel and elastic. You can use an container with an airlock or bail top jar as well, all my other jars are busy fermenting other things right now and the drinking glass fit snugly in the jar to keep out the air. If there is not enough brine to cover everything, leave it to ferment overnight and gently press the vegetables down again with clean hands. If you still don’t have enough brine after 48 hours or you don’t want to wait, mix 1 cup water with 5 grams sea salt, stir to dissolve and top up your container. Leave it to ferment at room temperature for anywhere from 5 days to 2 months. The flavor changes quite a bit over time. Taste test it once per week and once you love it, you can remove the weight, cover with a lid and store in the fridge. You’ll get the most probiotic benefits after at least 4 weeks. There may be a build up of CO2 depending on your containment method. To prevent breakage, ‘burp’ your jar every day or two but otherwise let it do it’s thing. It probably has nothing in common with Salvadoran tradition but I added a few raisins to some curtido and ate it straight from the bowl. 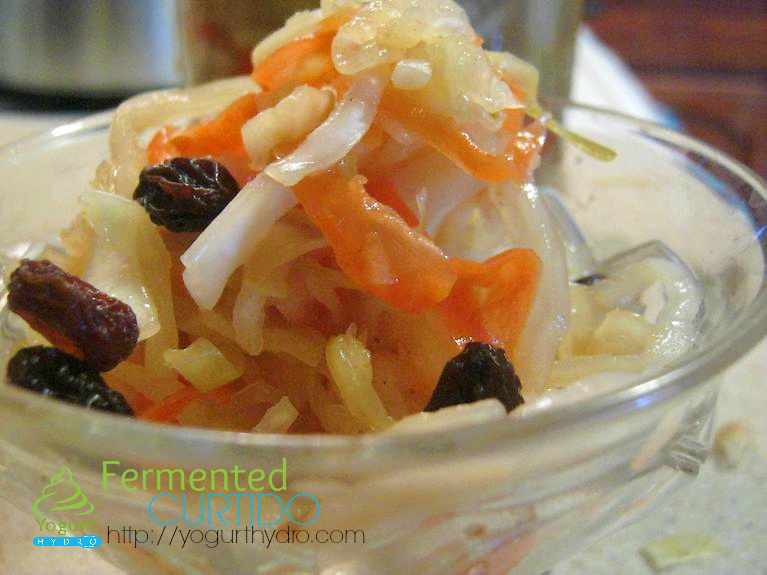 The tangy fermented curtido with the surprise sweet bursts of raisin made a delicious snack. Have you ever tried Curtido?